Wow, so dramatic. 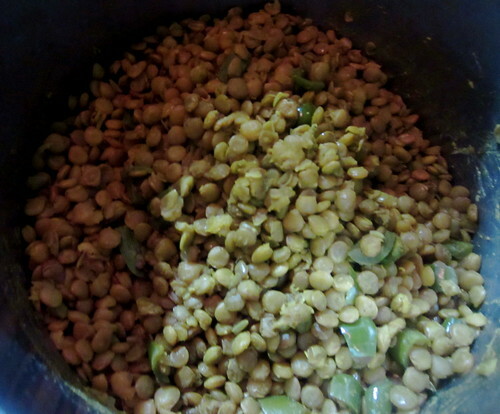 The title of this post refers to making more Hare Krishna food: lobia, or black-eyed peas in tamarind-ginger sauce. (Sorry, I don’t know how to link to a particular part of the page. Help?) I’m in a food rut and nothing sounded good except more interesting bean-based dishes, so that’s what I did (and a vegetable recipe that I hope will be better than last week’s—last week’s turned into such a debacle that I couldn’t even post about it). I had this weird idea that I had seen tamarind paste in my grocery store before, but of course I was wrong and it was guava paste. I ended up buying a box of whole tamarinds, and then discovered I probably shouldn’t have bought sweet ones, but I didn’t know there were different types of tamarinds. So this dish probably didn’t come out the way it was supposed to. I own a lot of black-eyed peas now. I’m not sure if I like them. That was step one in the unexpected difficulties. I soaked my black-eyed peas overnight and, the next day, boiled the water they were in and then added some ginger, turmeric, and chili powder. I then left it to cook for a while. This post was going to involve a lot of complaining about Mark Bittman, because I was thinking about something I thought he had once said—that some recipe of his was quicker to make than it would be to order in, and tasted better, too. I was going to say that Mark Bittman only dislikes greasy, salty Chinese takeout because he hasn’t eaten a drop of high-fructose corn syrup since he was fifteen and in his rebellious stage. But I can’t find this supposed quote, and also I like Mark Bittman, so I should probably stop complaining. After last week’s Indian mini-debacle (I’m declaring it a debacle because I have to eat it for lunch all week and this thought fills me with dread), I wanted something simple for dinner. 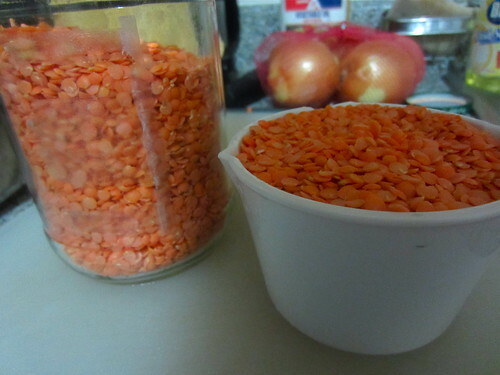 So obviously I decided to make dal and naan. But I chose two recipes from Budget Bytes, and her recipes are simple, well-illustrated, and suited to my American palate. (That sounds like a terrible insult; I just mean she doesn’t use crazy spices, and that’s what I wanted this week. Something that would at least approximate the familiar.) And I wasn’t really in the mood for cooking; I had Chinese takeout yesterday, so now all I want in the world is MORE CHINESE TAKEOUT. But no. 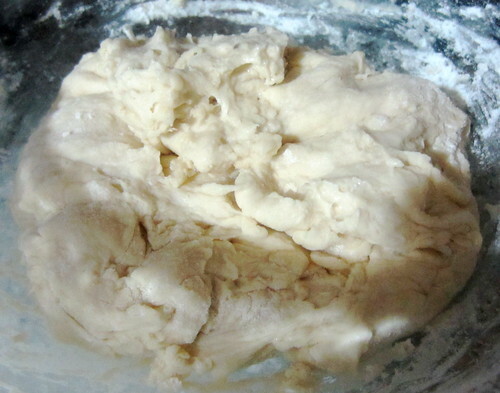 Naan dough, pre-rising. I didn’t knead it NEARLY enough because it was super sticky and I couldn’t tolerate it. I also didn’t form it into a ball. See: stickiness. Saag paneer + how to: make cheese! After ten, nay, maybe fifteen, years since my first attempt (in which Jacqui and I struggled with rennet and she ended up pouring whey all over my hands, as far as I remember), I have succeeded in creating cheese. Possibly. It is still sitting in the sink wrapped in cheesecloth being weighted down by a Dutch oven and a 28-ounce can of tomatoes. But it’s in there. Anyway. I came back from the laundromat, where I had been yelled at for not properly understanding the sign with their hours and for putting my clothes in to dry at an inopportune time vis-a-vis closing, and frantically began making cheese. A half gallon of milk went into the Dutch oven to boil; when I thought I spotted bubbles under the surface of the skin that had formed, I added three tbsp distilled white vinegar. 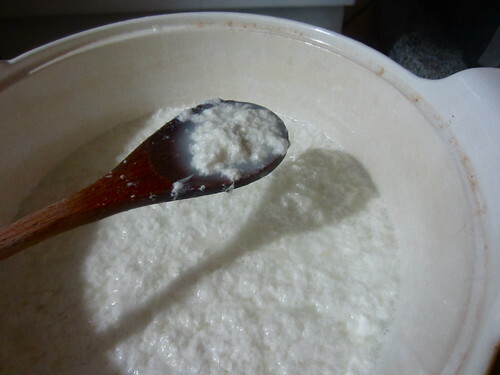 Exactly what you ordinarily never want to happen to milk happened: it curdled. I post a surprising number of gross-milk photos.